In 1995, Perinton Automotive Center started as the service department of DiPrima’s Mobil. For 11 years, that location gave us the opportunity to meet people and develop a relationship with the members of the community. The business grew, and by 2006 we required a larger facility. In 2007, we opened our new service center adjacent to the gas station. As the service manager and technician for DiPrima’s, Jeff Cline developed the business by making customers his priority. In 2006, he became the owner and, since then, has continued to earn the trust of his clients by being thorough, efficient, and productive. His team of technicians are hand-picked and highly qualified. As a team, they’ve selected and purchased state-of-the-art tools and equipment to make sure they can do quality work on vehicles of every year, make, and model. After 20 years of business, one thing has become clear: We don’t just fix cars. We help people. That usually means we’re helping our clients with their car and transportation troubles, but ours is a people business as much as any other. Consider us next time you are in need of help with your car problems. We look forward to getting to know you and your car and having the opportunity to earn your business. As an auto shop dedicated to the community, we see every client relationship as a priority and work hard to gain their trust. We are committed to providing the best auto services possible because we are committed to you. We understand that your time is valuable. Ours is too. So we strive to do every job with efficiency. 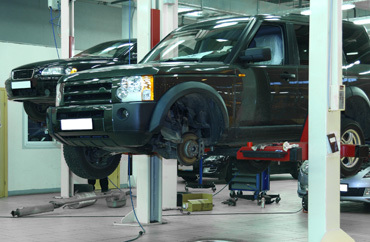 Our technicians conduct a thorough examination of each vehicle with a trained eye. Each employee is an expert in their own right, and we pair each vehicle with the right technician to ensure every minute is well spent and you aren’t billed for any time more than necessary. Your vehicles are one of the biggest investments you make. As with any large investment, you want to protect it and make sure you get as much out of it as you can. We feel the same way. So when something goes wrong with your vehicle, we want to help solve the problem. We work with you and keep you informed so, together, we can make the decisions that will best help you meet the goals you have for your car. As technology continues to advance, so do the tools required for maintaining the vehicles equipped with that technology. When it comes to tools and equipment, our experienced technicians’ input is just one of many important factors we consider when equipping our facility. We are committed to using state-of-the-art equipment so we can solve a problem for a vehicle of any year, make, and model. We carefully select our staff because we want to provide the best service experience possible. Our employees are important to us and we want them to know they’re valued. That’s why we offer a complete benefits package, encourage career advancement and professional development, and create a positive work environment. Low cost isn’t always better. Sometimes cheap is just cheap and it usually comes with poor quality. We won’t sell you what you don’t need, but we will provide a high quality service and recommend the parts and services we feel will best help you meet your goals - whether that means you’re keeping your vehicle on the road for a few more months or a few more years. Together we can custom tailor an estimate and repair option to meet your needs. There is a lot of opportunity for waste in the auto industry. But we understand the effect this has on the environment and are mindful of minimizing the footprint our shop leaves behind. That’s why we recycle everything we can, from papers, cans and bottles in the office and reception area to batteries, tires, oil, antifreeze, and scrap metal and aluminum out back. Similar to the relationship between a doctor and a patient, a technician gets to know a vehicle and its quirks by spending time with it. That’s why we don’t view you as a customer, but as a client and we hope for a long term relationship with you and your vehicle. As we get to know your vehicle and your goals for it, we are confident we can provide you with the best car care possible and save you money over the course of time. We can’t predict when things will go wrong, and therefore we know that sometimes we’ll have to work extra hard to make sure you are satisfied. When car trouble continues to bring you down, give us a call at 585-377-1660 and we’ll do what it takes to make it right. Need your car serviced? Call us at 585-377-1660. At Perinton Automotive Center, we provide complete automotive and light truck mechanical maintenance and repair.